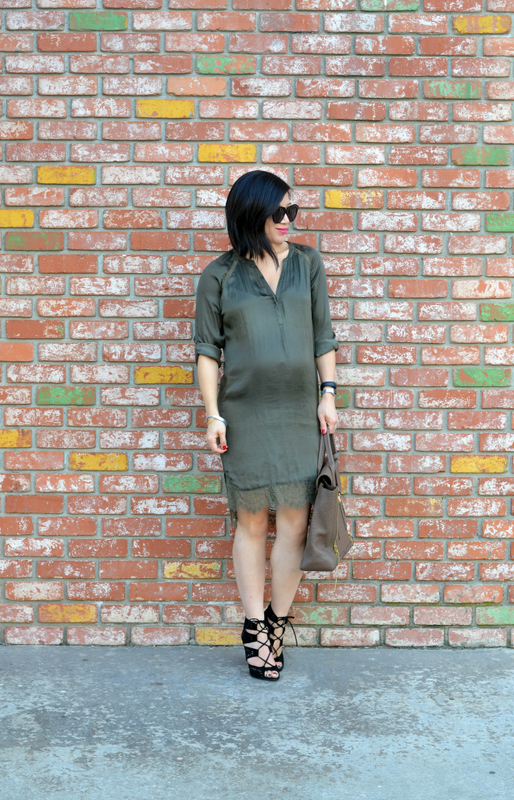 When I first wore this dress on the blog, the husband and I were keeping a secret. That secret, of course, was the fact that I was pregnant (we didn't tell people for a couple months afterwards). I wore that dress when we told the family the "big news" and secretly hoped that I could still wear this dress months later when my body would change shape. Thankfully, I was right. Needless to say, I have a lot of sentimental feelings for this dress. You are just the cutest! Loving this dress and the shoes are fab. Perfect look! Oh my goodness. This is just downright adorable. You look great, and I love the baby bump. And let's not forget those shoes! I need a pair like that in my closet asap! It's always sweet when an item of clothing can evoke such good feelings and it looks fab on you too! This dress is stunning. It is great that you will be able to continue to wear it even after the bundle of joy arrives. All these neutrals are great. But the heels really make it. Can't believe you are still able to rock those! Aww...it still looks great on you! Love it with the lace up heels! Love the dress, that color looks great on you! Such a chic look! So stylish! Those shoes are amazing! Gorgeous color and I love the lace details. I love it when their is meaning behind something. I love going back and seeing the first wear. You look so great in this dress. Great purchase considering how amazing it looks at all stages. That is a great dress! I love how flowy it is and the color is so chic. Your shoes are so pretty! My step-son and my daughter-in-law kept the big secret from us for twice! I will have my second grand baby this June. Lol. Thank you so much for visiting my blog, Take care and keep in touch! Could you BE any cuter?! Holy cow! :) Adorable. Love this dress. Especially the color!! I am Ada. I have actually stopped by here many months ago. Loving the new hairdo and your adorable baby bump. 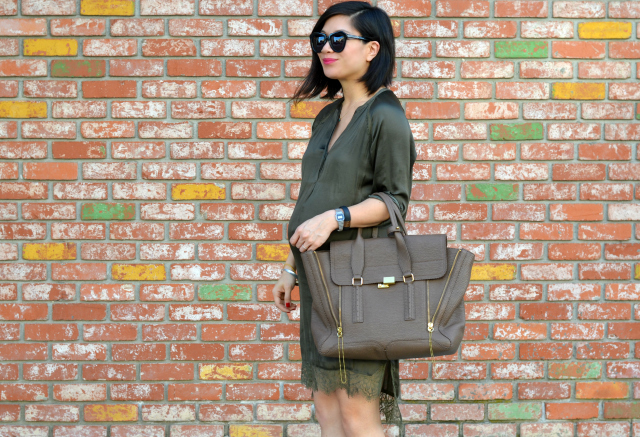 You are seriously one of the most gorgeous, most stylish moms-to-be. 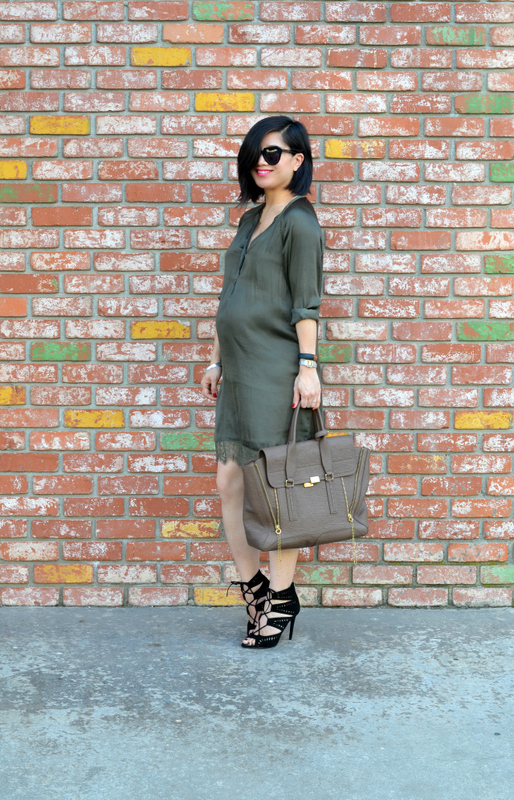 That olive dress is so pretty and it will work well post-partum also. I have missed it in case you announced it: boy or girl? Thanks for stopping by my blog last week also and for the lovely comment. This dress is so pretty! It's wonderful that it has all of these great memories attached to it! 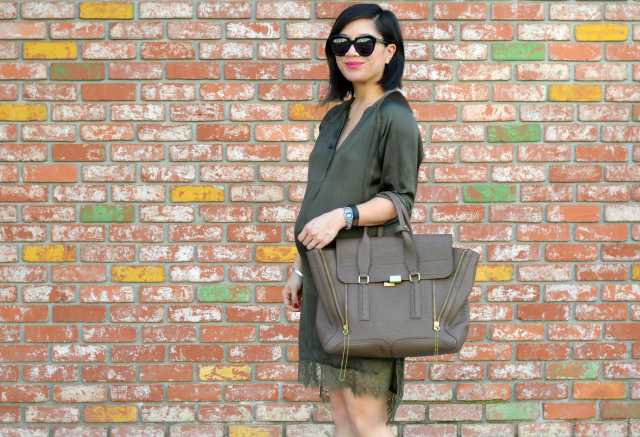 The olive color is gorgeous on you! Your outfit is so chic! I love your purse, heels and dress! It's perfect! I love this dress on you and how dressed up with the heels. Simply gorgeous and chic look! And those shoes - oh my! So chic! 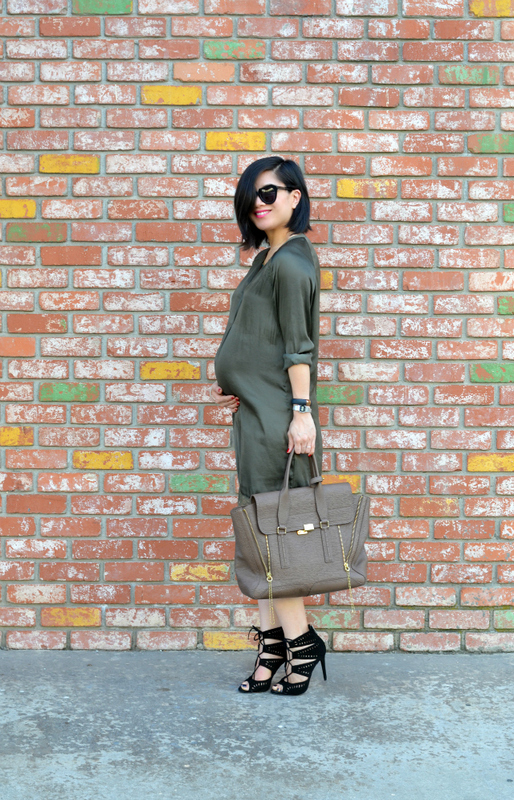 I love those shoes and your bump is adorable! I'm obsessed with your bag, it looks perfect paired with your dress here! !